Nepal earthquake death toll reaches 8,635, over 300 missing. Nepal earthquake victims without shelter ahead of monsoon rains. 270 aftershocks over 4 Richter in a month. Nepal focusses on sanitation to stem illness after quake. Lives at risk as Nepal earthquake funding dries up. India simplifies transit procedure for relief supplies. A devastating earthquake of the magnitude 7.8 struck Nepal near Lamjung, 80 kilometers northwest of the capital Kathmandu on 25th April, 2015. 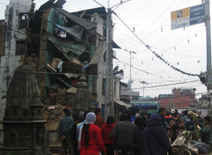 Continued aftershocks occurred throughout the country at the intervals of 15–20 minutes, with one shock reaching a magnitude of 6.7 on 26 April. The earthquake killed over 9,000 people and injured more than 23,000. Many more were feared trapped under the rubble. Hundreds of houses and buildings, heritage sites were demolished and some roads cracked wide open. Rural areas were cut off due to widespread destruction, and landslides. Estimates suggest that 130,000 homes were destroyed and 530,000 damaged. Over 8.1 million people across 39 districts were severely affected. Kathmandu, situated on a block of crust approximately 120 km (74 miles) wide and 60 km (37 miles) long, reportedly shifted 3 m (10 feet) to the south in a matter of just 30 seconds. Kavrepalanchowk, Rasuwa, Sindhupalchowk, Nuwakot, Gorkha were among the districts that were severely affected, with very high death tolls. A major aftershock occurred on 12 May 2015 at 12:50 NST with a moment magnitude of 7.3. The epicenter was near the Chinese border between the capital city of Kathmandu and Mt. Everest. More than 200 people were killed and more than 2,500 were injured by this aftershock. Pragya is currently engaged in rehabilitation efforts for the people affected in the Nepal earthquake. Our efforts span across the worst affected Gorkha, Dhading, Rasuwa, Sindhupalchok, Kavrepalanchok and Dolakha districts. Pragya UK is registered as a Charity with the Charity Commission for England and Wales (Charity No: 1082476). You can Gift Aid your donation. Pragya US is registered as a 501(c)(3), tax-exempt non-profit organisation. Your donation made to Pragya US is tax deductible, to the extent allowed by law. Pragya has been working in the Himalayan region including Nepal for the last 2 decades and has carried out intensive relief and rehabilitation work during the flashfloods in Leh in 2010, Uttarakhand floods in 2013 and then again during the Jammu & Kashmir floods in 2014.